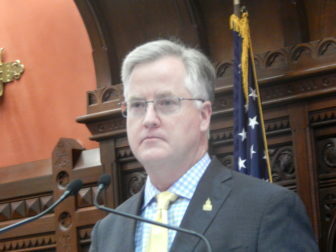 House Speaker J. Brendan Sharkey became the first Democratic leader Friday to call on Insurance Commissioner Katharine L. Wade to recuse herself from ruling on Anthem’s merger with Bloomfield-based Cigna, the commissioner’s last private-sector employer before joining the administration of Gov. Dannel P. Malloy. Malloy, who spoke to reporters before Sharkey’s statement, said he saw no actual or apparent conflict in Wade’s continuing to play a pivotal role in reviewing the merger of the two major health insurers. He said there was no reason for the public to question Wade’s independence. 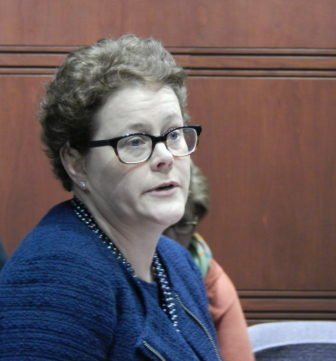 Less than an hour later, Sharkey issued a statement saying that at the very least Wade’s connections with Cigna, including her husband’s continued employment there, was problematic, even if the state ethics office has found no conflict with the state ethics code. Wade is the leading state regulator on the Anthem-Cigna merger, a $48 billion deal that was announced last year within weeks of the one between Aetna and Humana, which is worth about $37 billion. The two mergers would shrink the U.S. healthcare insurance market from five major insurers to three. The Universal Health Care Foundation is circulating an online petition calling for Wade to leave the insurance department. Senate Minority Leader Len Fasano, R-North Haven, and Sen. Kevin Kelly, R-Stratford, reiterated Friday a call they first made last fall for Wade to step aside.